This is a pic of Molly from the Uintahs. 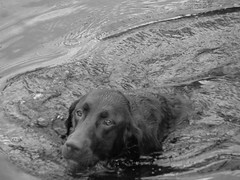 This dog LOVES to swim. She must have swam halfway across the lake and back 15 times. Every time we were near water she took off, jumped in and then rejoined us. Any doubts that she is a Lab? I took this in B&W hoping for a cool shot….I think I got one.